First, please remember that donations given Tuesday can be doubled! Regular donations, through the usual website, will be matched dollar-for-dollar, and will go straight to my personal support. There are limited matching funds available, and it’s first come, first serve. Matching starts at 12:00am EST on Tuesday, which is actually 11pm on Monday for those in the Central Time Zone. So try to donate Monday night starting at 11pm or early Tuesday morning. For issues or questions, I’ll be available at an online chat room. Day 1: Succeeded in measuring my water use. Total: 100 gal, or 380 L. That’s exactly U.S. average, but it’s abnormally high for me in Bolivia; I did laundry, cleaning, lots of cooking, and took a long shower. Day 2: Attempted to limit my use to 75 L (20 gal). Didn’t quite make it; my use was 23 gal. I didn’t flush every time, the shower was only running 2 minutes, and I didn’t do laundry or cleaning. So here’s what I take away. First: I can limit my water use dramatically, but wouldn’t be able to sustain it for more than a couple days. 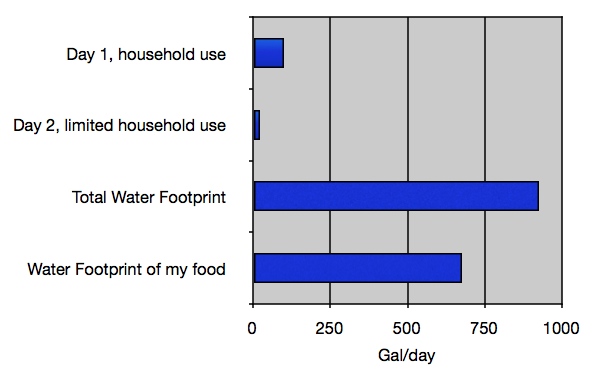 Second, I learned that household water use alone is not the big problem- it’s our Water Footprint. My Water Footprint is not just the water I use from the tap, but also the water that was used to produce the things I consume. E.g. if I drink a cup of water from a stream, the Water Footprint is a cup. If I drink a cup of fresh-squeezed orange juice, my Water Footprint is more than a cup; it includes a portion of the water that irrigated the orange tree. For a cup of bottled water, my Water Footprint includes water used in the bottling plant and used to extract oil from the earth and turn it into diesel fuel for transportation. For a better explanation, I like the WSJ’s article about this issue. So how does this relate to my experiment? I cut my household water use by 77% percent, but it turns out that household use is only a sliver of my overall Water Footprint. My hard work limiting my water use could have been replaced by just eating two fewer bites of beef, a food with one of the highest Water Footprints. So, though it’s still worth it to use less water in the house, by changing my diet or transportation I more effectively do my part to avoid future water shortages, especially in Bolivia. National Geographic has a fun Water Footprint Calculator– how do you compare to the average? 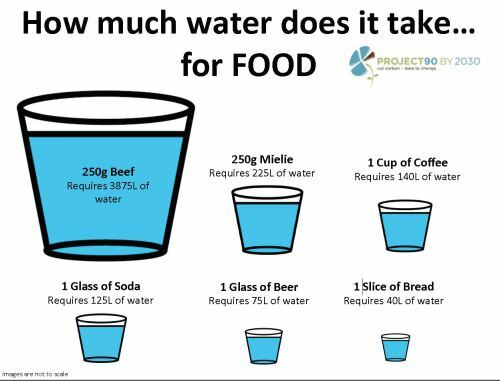 The concept of a Water Footprint is new to me- had you heard about this before? From my friend in Bolivia working on a water project. Read down about water foot print. Interesting Beef is the food that uses most water.